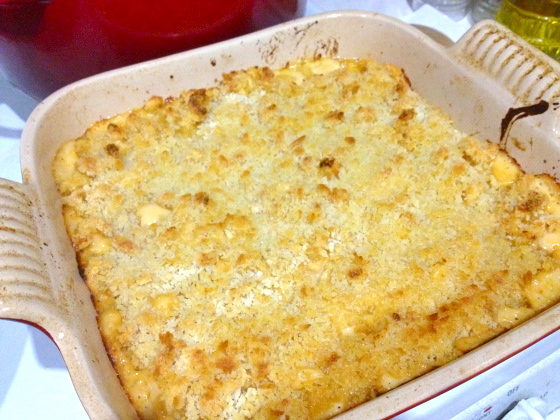 Gail’s Baked Mac ‘n’ Cheese. I went to college about 1000 miles away from home, and at times it was rough for a homebody like me! Home is comforting and safe and easy—and that’s part of the reason why I wanted to go far, far away. To stretch myself a bit, get uncomfortable, and try something a little bit scary. But not every experience needs to be new and unknown; sometimes safe and comfortable is just what the doctor ordered. And without any of my own family nearby, college-me found it especially thrilling to get to spend a weekend at the homes of some of my friends. It was so much fun to hang out with their families, pet their dogs, and see what it was like in the towns where they grew up. Visiting my beloved roommate Maura’s family was always a lot of fun for many reasons, not the least of which was the amazing FOOD! Maura’s mom and dad are awesome cooks and never failed to whip up something absolutely delicious whenever I came to visit; I have droolingly fond memories of her mom Gail’s key lime pie, and her mac ‘n’ cheese was always out of this world. 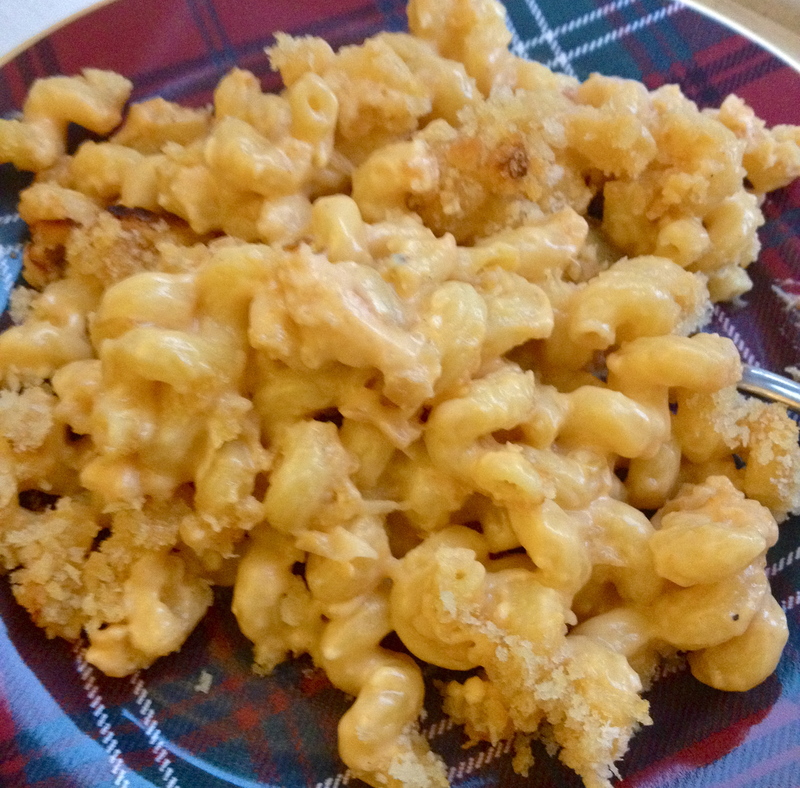 I was overcome with a craving for it this past weekend, and they were nice enough to share the recipe with me. 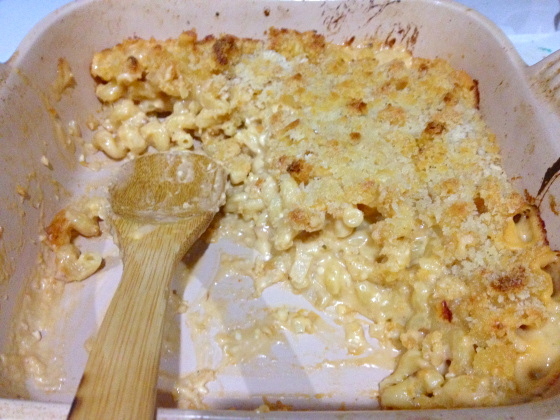 And, no surprise, it was the best mac ‘n’ cheese I’ve ever home-made myself. 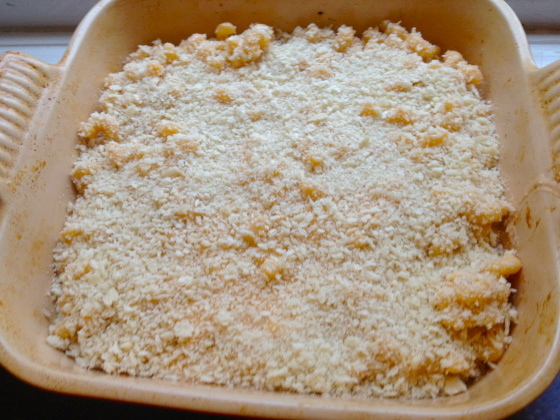 Check it out – this is the amazing Gail’s Baked Mac ‘n’ Cheese! Cook the pasta in boiling salted water until slightly underdone. Reserve 1 cup of the pasta cooking water (it’s nice and starchy and is great to have on hand to add to the sauce later), and then drain the pasta and set it aside. It will finish cooking in the oven later. 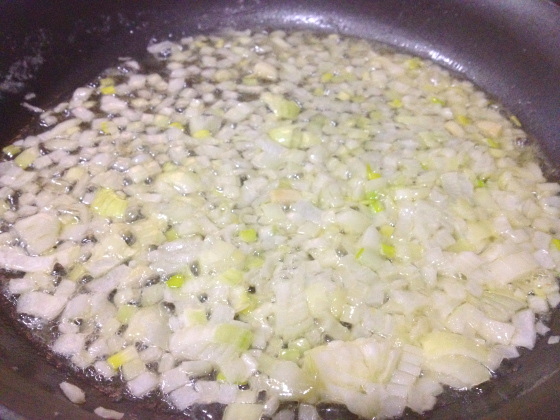 Heat butter and a drizzle of olive oil over medium high, and add the onions. Cook until softened and translucent. Add the flour and stir as it forms a paste. Let it cook for about 2 minutes, stirring the whole time. Then grab your whisk and slowly pour in 1 cup milk, whisking vigorously to avoid creating any lumps. 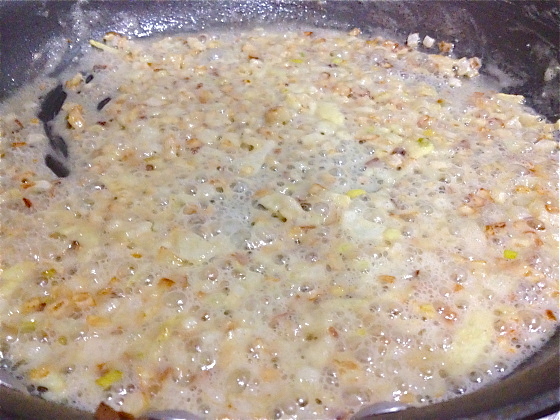 Once this first addition of milk is incorporated, whisk in the rest of the milk. 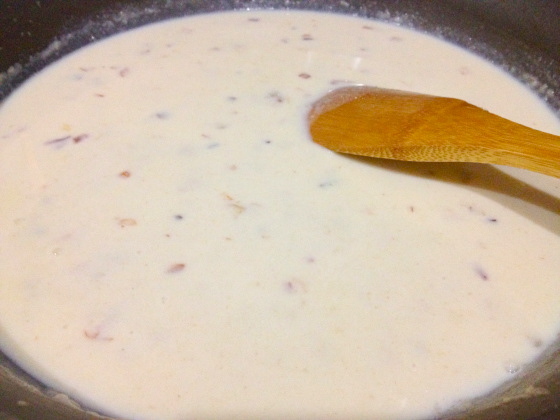 once all the milk is incorporated, you can trade in your whisk for a spoon if you like, and keep stirring as the sauce thickens. 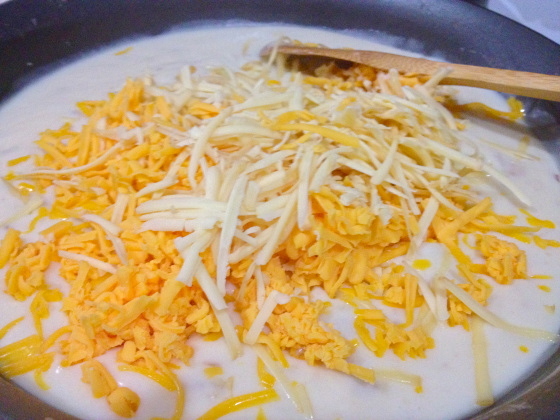 Once the sauce has thickened and coats the spoon thickly, stir in the cheese. Add the nutmeg, salt, pepper, Sriracha, and Dijon mustard at this point, tasting and adjusting to get the flavor you want. I ended up adding a lot more Sriracha than I initially planned. It’s just so good in here. By this time, the sauce had thickened a little more than I wanted it to. 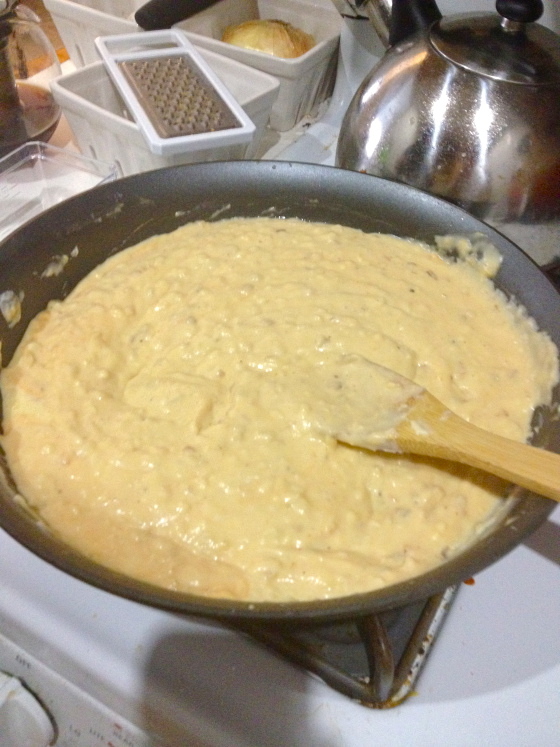 To get it back to that gooey creamy sauciness, I added a bit of the pasta water that I had set aside earlier. 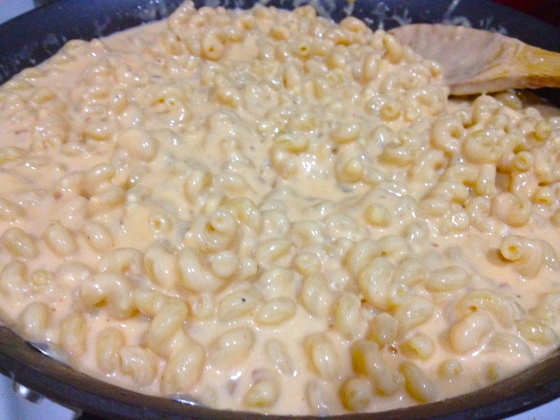 When the sauce consistency is to your liking, stir in the pasta and coat it completely in beautiful cheesy goodness. Pour the whole thing into a greased baking dish and spread it out evenly. Top with bread crumbs and drizzle with a bit of olive oil. Bake for 20-30 minutes, or until the sides are bubbling and the topping is browned and crunchy. That looks so creamy and delicious. Yumm!! I just made this. I added lots of veggies, and some extra cheese. It was freaking amazing. Thank you so much! Oh la la! I can’t wait to make this for the kids. They will love it…and homemade is waaay better than the crap from the blue box, you know?! Thanks for sharing!